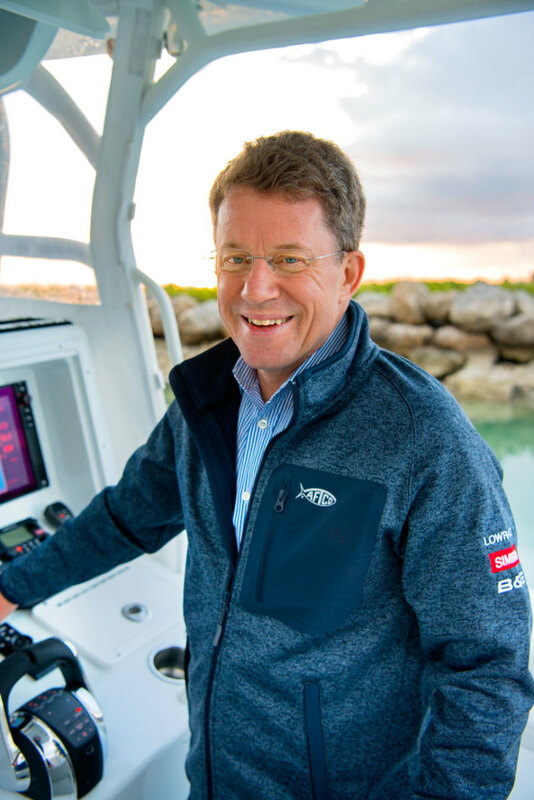 The economic indicator that Navico CEO Leif Ottosson watches first and foremost is consumer confidence, and The Conference Board’s measure of the American consumer’s mood delivered good news to Navico and the rest of the recreational marine industry at the end of August. The business research group said its Consumer Confidence Index rose 5.5 points, to 133.4, the best result in nearly 18 years. “Consumer confidence increased to its highest level since October 2000 (when it was 135.8), following a modest improvement in July,” Lynn Franco, director of economic indicators at The Conference Board, says in a statement. Consumer spending accounts for about 70 percent of U.S. economic activity. Ottosson, who also monitors the stock market, consumer spending and job growth for additional insights, says the economy appears healthy but bears watching. Electronics manufacturer Navico is the parent of the Lowrance, Simrad, B&G and C-Map brands. The high confidence number implies that consumers aren’t overly worried about the effects the tariffs will have on them. “Confidence is soaring to new heights, which makes us bullish on growth and forecasts that this expansion may indeed shatter records for longevity next summer,” Chris Rupkey, chief financial economist at MUFG Union Bank in New York, tells the Associated Press. A separate survey by the University of Michigan offered a more tempered view of consumer confidence heading into the fall. The university’s preliminary Consumer Sentiment Index for August, released Aug. 17, found that sentiment slipped to 95.3, its lowest level since last September, “with the decline concentrated among households in the bottom third in income,” Richard Curtin, chief economist of the university’s Surveys of Consumers, says in a statement. The final index reading for the month rose to 96.2, but the gauge was still at its lowest level since January. It was 97.9 in July. “The dominating weakness reflected much less favorable assessments of buying conditions, mainly due to less favorable perceptions of market prices,” Curtin adds. “Buying conditions for large household durables sank to the lowest level in nearly four years. When asked to explain their views, consumers voiced the least favorable views on pricing for household durables in nearly 10 years, since October 2008. Vehicle-buying conditions were viewed less favorably in August than any time in the last four years, with vehicle prices being judged less favorably than any time since the close of 1984. “Home-buying conditions were viewed less favorably in early August than any time in the past 10 years, with home prices judged less favorably than any time since 2006,” Curtin adds. “These are extraordinary shifts in price perceptions, given that consumers anticipate an inflation rate in the year ahead of 2.9 percent in early August, unchanged from [July]. The Conference Board says its Leading Economic Index, which measures the economy’s health, increased by 0.6 percent in July, to 110.7, after a gain of 0.5 percent the previous month. The index attempts to predict future economic activity. “The U.S. LEI increased in July, suggesting the U.S. economy will continue expanding at a solid pace for the remainder of this year,” Ataman Ozyildirim, director of business cycles and growth research at The Conference Board, says in a statement. “The strengths among the components of the leading index were very widespread, with unemployment claims, the financial components and the ISM New Orders Index making the largest positive contributions,” Ozyildirim adds. The Commerce Department says consumer spending rose by a healthy 0.4 percent in July (retail sales were up 0.5 percent), but prices rose, as well. The core Personal Consumption Expenditures Price Index, which excludes the food and energy categories and is the Federal Reserve’s preferred inflation gauge, rose 0.2 percent. That boosted the year-over-year increase in the core index to 2 percent from 1.9 percent in June. A key small-company index improved in July. The Small Business Optimism Index of the National Federation of Independent Business rose 0.7 points, to 107.9. The NFIB says it was the second-highest level in the survey’s 45-year history, just under the 1983 peak of 108. Eight of the 10 index components improved, led by plans to increase employment and expectations for rising sales and for expansion. The NFIB says the July report set records in terms of owners reporting job-creation plans and those that had job openings. “Despite challenges in finding qualified workers to fill a record number of job openings, they’re taking advantage of this economy and pursuing growth,” adds NFIB chief economist Bill Dunkelberg. The housing market did not fare well in July. The Commerce Department says sales of new homes fell 1.7 percent, to a seasonally adjusted annual rate of 627,000, from 638,000 in June, although they were up 7.2 percent for the year through July. Housing starts rose slightly in July, to an annual rate of 1.17 million, from a revised 1.16 million in June. They were up 11.6 percent in the Midwest and 10.4 percent in the South, but they fell by 11 percent in the West and 4 percent in the Northeast. Through July, starts are 6.2 percent higher than they were during the same period last year. The National Association of Realtors says sales of existing homes fell for the fourth month in a row in July, dropping 0.7 percent, to a seasonally adjusted annual rate of 5.34 million, from 5.38 million in June. Through July, sales were down 1.5 percent from a year earlier. NAR chief economist Lawrence Yun says in a statement that price increases have reduced demand. “Too many would-be buyers are either being priced out or are deciding to postpone their search until more homes in their price range come onto the market,” Yun says.